What you will need for this activity: six different types of yummy food. We suggest the following: mini marshmallows, peanuts, M&M’s, chocolate chip cookies, twizzlers, and gummy bears. * You will also need a clear plastic cup, and toothpicks (2 for each student). You may want to appoint a great story teller--or your teacher/guardian can do that. For a text only version of the story click here. The year is 1745. The area is the southern part of modern-day Albemarle County, but at this time, there is not yet an Albemarle County. It hadn’t been created yet. A group of men gather at a house on a hill high above the James River, owned by a man named, Edward Scott. Together these men started a settlement known for a while as Scott’s landing, named after Edward Scott himself, and then eventually changed to Scottsville when it officially became a town. The river was rich in resources and the soil around it was good for farming, so folks began to settle here. Only a few families lived here at first, sparsely populating the area. AT THIS POINT, STOP THE STORY TELLING TO PLACE A LAYER OF MARSHMALLOWS IN THE BOTTOM OF YOUR PLASTIC CUP TO REPRESENT THE “Early Settlement” OF THE AREA OF SCOTTSVILLE. DON’T EAT THEM YET! The town grew and grew as settlers came from all over to take advantage of the good crops. In 1818, Scott’s Landing became a town and was then recognized as the first county seat of Albemarle. Traffic flourished along the river down to Richmond. The town’s importance was increased when Shenandoah Valley counties started sending their cargo by wagon over the Staunton and James River Turnpike to Scottsville’s port, to have it then sent down the river towards Richmond. By 1835, Scottsville had a population of 600 people, and warehouses and buildings started springing up everywhere. AT THIS POINT, STOP THE STORY TELLING TO PLACE A LAYER OF PEANUTS ON TOP OF THE MARSHMALLOW LAYER TO REPRESENT THE TIME WHEN “Scott’s Landing becomes Scottsville.” DON’T EAT THEM YET! As buildings sprang up, there was great need for a reliable source of cargo transportation. The river often flooded, or even got too low in times of drought. So, in 1840 the James River and Kanawha Canal opened up between Richmond and Lynchburg. The canal offered safe and cheap transportation of goods to Virginia’s capital. By 1841, Scottsville’s population was at 1,000 people. The roads leading to Scottsville were poorly kept, and often too dangerous for the wagons from the Shenandoah Valley to journey across. Trade in Scottsville began to decline as the wagons followed the safer roads towards other locations along the canal, such as Lynchburg. By 1850, the population had decreased once again to just over 600 people. AT THIS POINT, STOP THE STORY TELLING TO PLACE A LAYER OF M&Ms ON TOP OF THE PEANUT LAYER TO REPRESENT THE TIME WHEN “The Canal is opened, but the roads are poor.” DON’T EAT THEM YET! Just after 1850, the Virginia Central Railroad was constructed in Charlottesville and this form of transportation was safer than the Staunton Turnpike and other poorly kept roads that led to Scottsville. The new railroad also provided a quicker route to Richmond than the old way using wagons and canals. AT THIS POINT, STOP THE STORY TELLING TO PLACE A LAYER OF COOKIE ON TOP OF THE M&M LAYER TO REPRESENT THE TIME JUST BEFORE “The Civil War Destruction.” DON’T EAT THEM YET! In addition to the decreased use of the canal as a result of the new railroad, in 1865, four full years after the start of the Civil War, Scottsville was hit with a devastating blow. General Sheridan’s group of 10,000 Union soldiers left Charlottesville in two groups. One group was sent to destroy the railroad, and the other group was sent south to destroy the canal at Scottsville. The destruction of Scottsville began at 3 PM on March 6, 1865. Boats were captured; warehouses full of supplies were burned. Canal locks and bridges were destroyed and the town’s houses and barns were ransacked for food and goods for the Union soldiers. The last wave of soldiers left a hungry and burning town of Scottsville behind on March 9, 1865. Ravaged by war and floods, the canal was no longer able to perform its duties and provide any income for the town. In 1880, the deed to the canal was signed over to the Richmond and Allegheny Railroad Company. They immediately came in and began to build their track over the old canal towpath. Even though the railroad had come to Scottsville, prosperity did not. Unlike the days when Scottsville was an important shipping point, the railroad gave Scottsville no special purpose. There was simply a small depot for travelers to come and go, but no major industry was held here. By 1890, the population of Scottsville had decreased significantly to 362 citizens. STOP THE STORY TO PLACE THE TWIZZLERS ON TOP OF THE BROKEN COOKIE TO REPRESENT “The Railroad.” IT’S ALMOST TIME TO EAT THE CANDY, BUT WE HAVE TO FINISH THE STORY FIRST. 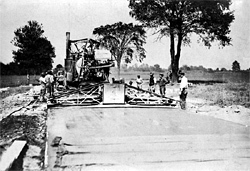 In 1907 highway transportation and the construction of the Scottsville bridge saved the town and its residence from becoming a ghost town. With the invention of the automobile, the country was able to move around a lot more, and life started moving just a little bit faster. By the end of World War I, two state highways intersected in Scottsville allowing residents to come and go, as well as visitors. Today Scottsville remains a quiet town with Main and Valley Streets serving as the focus of business. The river provides tourists and townspeople a great form of entertainment and relaxation thanks to the excitement of water sports such as tubing and canoeing. THE STORY STOPS HERE. FINALLY, PLACE YOUR LAST LAYER OF CANDY, THE GUMMY BEARS, ON TOP OF THE LAYER OF TWIZZLERS. 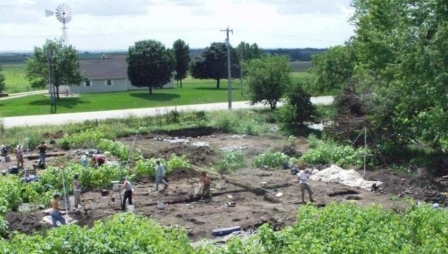 NOW IT IS TIME TO BEGIN YOUR EXCAVATION! A picture from Bowen's Prairie. The place where the bottle came from. So what you have in front of you is more than just a cup full of goodies. These layers each represent an important time in Scottsville’s history where new artifacts can be found by digging through the layers. If you were digging in real dirt each layer would look very different, sometimes almost as different as the layers of candy you have, and the archaeologist would examine the change in color, content, and texture of the soil to determine if he were at a new period or layer of occupation. Now put on your hard hat, get out your pick and shovel (or get your two toothpicks), and start digging. You have received a grant from the Historic Preservation Society to find out as much as you can about the time General Sheridan and his troops destroyed the town of Scottsville during the Civil War. Carefully dig out each layer, starting first with the gummy bears representing 1907-present day. Record what you find. Are you finding artifacts from the old stores that were replaced by new stores on Valley St.? 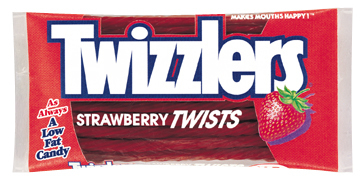 Next, dig out each part of the layer of twizzlers representing 1880-1907. Are you finding any old nails or railroad ties from the first construction of the railroad in Scottsville? Now you should come to the layer that you and the Historical Society are most interested in: the period of destruction caused by the Civil War. Carefully extract as much of the pieces of cookie you can without disturbing the layers beneath. Did some of your cookie pieces fall though your layer of M&Ms? This happens in real dirt all the time. Some of the layers above can get mixed in with the layers below and it is your job as the archaeologist to note when something is out of the ordinary. For example, in Ancient Greece the people would use old materials from ruined temples in the walls of the next building. So, you might find an ancient piece of marble from the temple of Zeus, used to build a wall that came 400 years later. Now, either continue carefully digging apart the layers of your excavation, or cause some destruction of your own by eating it all! You’ve earned it! Great job young archaeologist! *NOTE: The Scottsville Museum does not endorse any of the above products. They are mentioned here for example only. This activity was adapted from an Ancient History lesson created by Seth Pevnick, a former student of Classical Archaeology at Dartmouth College. Seth taught second grade with Teach for America and is currently working on a Ph.D. in Greek archaeology at UCLA.